Members of the US militalry’s Combined Joint Task Force-Horn of Africa communications team recently worked with Burundian National Defense Force’s communications unit to share best practices for installing, operating, and maintaining their newly refurbished African Data Sharing Network (ADSN) satellite terminal, June 8-17. The ADSN is a tactical intelligence sharing platform that allows critical intelligence information to be shared between the African Union Mission in Somalia’s (AMISOM) Troop Contributing Countries (TCC.) In addition to Burundi, TCC include Kenya, Djibouti, Ethiopia, and Uganda. The ADSN allows all these countries to share intelligence information in order to accomplish their mission in Somalia. Metzker traveled to Burundi to assist in the sharing of best practices of the ADSN that is also capable of secure data, voice, and even video teleconferencing. The use of this platform allows for collaboration between AMISOM force leadership back in their home countries as well as well as their forces forward deployed into Somalia. It’s been nearly a year that CJTF-HOA troops been in Burundi, and a first for communication troops to share ADSN best practice techniques and tips with the AMISOM partner. “It is an honor to be invited and take part in such an important aspect of the BNDF’s mission of combating the violent extremist organization, Al Shabaab,” said U.S. Army Spc. Richard Taylor, 422d Expeditionary Signal Battalion, currently attached to CJTF-HOA’s Tactical Network Team. 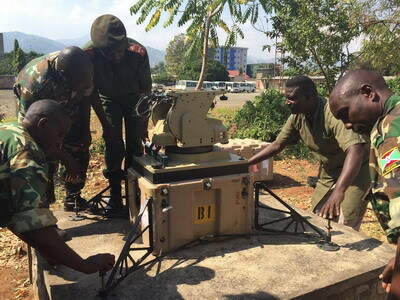 During the ten days of sharing best practices, communications personnel worked with over a dozen members of the Burundian National Defense Force, explaining lessons learned and best practice videos put together in partnership with CJTF-HOA’s combat camera unit. The event culminated with a CJTF-HOA intelligence representative reviewing, with the BNDF troops, the updated features of the intelligence sharing platform itself, which also received a recent overhaul.